After the humorous but mortifying story of shopping for my brother’s jock strap, I thought I would post a nice memory of my brother’s companionship. It comes at the end of this meandering trip down memory lane, so stroll on with me for 800 words or so. My brother was in high school when I was in college. Actually he was in grammar school AND high school when I was in college, since I liked college and stayed there as long as possible. And by as long as possible, I mean until my parents insisted I wrap it up. So I reluctantly graduated. You needed 120 credits to graduate. I had 148. And Ma Bell was one strict Mama. Skirts and pantyhose, no slacks, no snacking, no chatting, and you had to ask to use the bathroom. And no air conditioning. And the pay sucked too. But it was easy, and my sisters worked through college for even suckier pay inspecting springs in a sweltering dirty factory. So I was actually lucky. And I knew it. It was the end of an era at Ma Bell. Pre-computers, Directory Assistance meant sitting at a station with humongous phone books for every city in Connecticut. You heaved those big hinged books and looked up phone numbers – all day long – wearing a big Ernestine headset that made your head ache in four places. You’d look up number after number, and then you’d look at the clock and three minutes had gone by. 477 to go. I was a hippie back then in the early seventies. And I was kind of the token liberal at the Phone Company. Sometimes I think they found me quaint and humorous, like a harmless little raccoon that you find on your porch. In my novel, I described a dress that my protagonist buys for her newly acquired daughter – a purple tee-shirt dress with a yellow lightning bolt down the front. Well, I had that dress. And one day a guy came in from corporate headquarters to interview employees for the company newsletter, and I was wearing the purple and lightning bolt dress and my wire-rimmed John Lennon glasses, and so guess who he interviewed. “What would you do if you were the President?” he asked. “I meant the president of the COMPANY,” he explained with a smirk. “Oh, then I think I would buy better pencils,” I said with my own smirk. The worst part of my job was the hours. The year-round employees got the best shifts, which was only fair, but that left me most days with 2:00 – 10:00 PM. Not exactly conducive to a college girl’s love life. Good thing I didn’t have one. But the best thing about the job was my teenage brother. “Oh, thanks, I had completely forgotten,” I’d say in my ditziest hippie-voice. No one wanted to see my poor aunt get stranded late at night. But by “aunt,” my brother meant “pizza.” He had called Main Street Pizza, right near the phone company, and there was a medium pizza with peppers and meatballs waiting for me at 10:00 PM. And I’d pick up my “aunt” after work and my brother and I would share a late-night pizza in front of the TV after my parents had gone to bed. It was really good pizza and really good company. 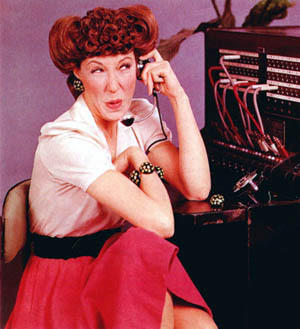 “One Ringy-Dingy, Two Ringy-Dingies.” Lily Tomlin as Ernestine. At the kind of switchboard I used. I think an older brother and younger sisters would have been cool. I had it the other way around, but it seemed to work out anyway. I LOVE that story!! And I think it’s really cool that you worked at the phone company. Lots of chuckles in this post. There aren’t too many of us around anymore that worked a switchboard. There’s just so much here to enjoy – I loved every minute of this story – but the “don’t forget to pick up your aunt” had me rolling – such a classic brother move! The first time my brother did that, we had planned to get a pizza that night. He wanted to remind me but knew I couldn’t take personal phone calls. When the message came that my brother called about “my aunt” – I had a hard time not falling off my stool. Code words. Love it. This is a delightful story, Nancy. Do you think o f them as the good ole days? Yes, I do. I have the BEST childhood and family memories. At least it seems that way now. Actually, one of the factories I worked in wasn’t that dirty or hot, but even in that one the work was boring. Working on an assembly line made me thankful that I was getting a college education. Yes, I was always very happy at the end of the summer to go back to school. Probably why I wasn’t so keen on graduating. I was a long distance operator for two years in the mid-60’s. It was my first job out of high school at age 17. At first it was switchboards with cords and plugs like yours, then we converted to a new, automated push-button system from Germany that was the most modern in the whole country. It was installed by German engineers, most of whom spoke no English. I was one of the first to train on it and til the conversion was complete, worked part of the day upstairs on the new system and downstairs on the old one. Great fun…good memories. I never even saw the new systems – but I knew they were being installed elsewhere in the state.Our switchboard was so old it had little gnats flying around it. Truly. Fun story. 🙂 Phones sure have changed, haven’t they? This is a wonderful story of sibling adoration. Yes I said it, adoration. My younger brother and I fought like cats and dogs, mostly; though we had a strange love as well. I loved the story of your time at the phone company. I can see you now. My grandma couldn’t afford a collect call from her son, who was stationed 500 miles away, he would call every Friday collect, she would refuse the call but she knew he was ok. This was probably the only sin my grandma did, if that is a sin. Sure made me cry, thinking of this story, thanks its a good cry. This was circa 1964, I was only four but I saw the relief it gave her a few times I was visiting her home.